Morgan has developed new extra-large crucibles for aluminium casters. A specialist in crucible and foundry solutions has developed new extra-large crucibles for aluminium casters, using one of the world's largest cold isostatic presses (CIP). 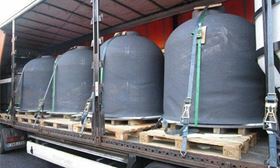 Morgan Advanced Materials’ Molten Metal Systems (MMS) business has successfully developed extra-large ISO-pressed crucibles with a capacity to hold up to three metric tonnes of molten metal. Morgan says that it can also make crucible sizes to hold between six and ten metric tonnes of molten metals for specific melting requirements. ‘The development of our latest crucibles and foundry products is a result of more than 100 years of experience in non-ferrous metal melting and holding applications,’ said Mirco Pavoni, global technology director, Molten Metal Systems. This story is reprinted from material from Morgan, with editorial changes made by Materials Today. The views expressed in this article do not necessarily represent those of Elsevier.